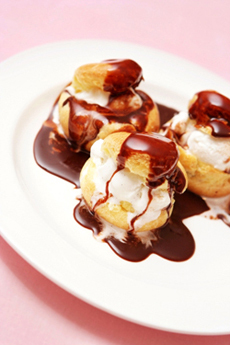 One of mankind’s favorite places to pour chocolate sauce is on top of ice cream-stuffed pâte à choux. The dish, known as profiteroles, is a name said to derive from profit, a French word meaning small gift, which is indeed what it is. Photo by Kevin Russ | IST. When you see that line-up of products on the shelf, exactly what’s in the jar or bottle? What exactly is the difference between chocolate syrup and chocolate sauce? Here, we explain the tasty differences. We have more than 60 food glossaries to provide insights and reference on your other favorite foods. This is Page 1 of a two-page glossary. If you think we should consider definitions other than those we have provided, click on the Contact Us link. Caramel sauce is made from the same ingredients as caramel candy. The best recipes are simply cream, butter, sugar and flavoring such as vanilla, although cayenne, coffee, maple, and a broad variety of flavors can be used. Salt can be added to make salted caramel sauce; chocolate can be added to make chocolate caramel. At room temperature, a good sauce will be almost as thick as caramel candy, and can be eaten from the jar as “spoon candy.” It is heated to become pourable. Caramel syrup is a clear, golden-colored sugar syrup that omits the cream and butter found in caramel candy and caramel sauce. The sugar is caramelized at high heat, making it look and taste different from a simple sugar syrup. It’s easy to make and is used as a dessert syrup on ice cream, cake, pie and pudding. It is also added to beverages, and has found new fans mixed into coffee for a caramel macchiato. French for “strained liquid,” coulis is a sauce made from puréed and strained fruit or vegetables (strawberries, raspberries, and tomatoes are most commonly used). 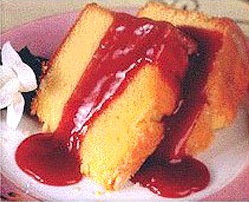 A coulis (pronounced coo-LEE) is often served over breakfast items, such as pancakes, crêpes and waffles or pancakes, or over dessert items, such as ice cream, cheesecake and soufflés. The term became popular during the ascent of nouvelle cuisine that in the 1980s, when newer items such as basil, mint and tomato coulis were appearing on plates, to make the preparations seem different and even more exciting than a traditional purée. To split hairs, in a coulis the liquid has been strained, removing any seeds or fiber. A purée is not necessarily strained, although professional chefs would be trained to strain their purées. French for “English custard,” a rich, pourable custard sauce that can be served hot or cold over cake, fruit or other dessert. Made with eggs, sugar and milk or cream, it is stirred over heat until it thickens into a light sauce. However, it’s a delicate operation: too much heat turns it into scrambled eggs! Vanilla is the basic flavoring, but coffee, chocolate or liqueurs can be added. With additional yolks and with heavy cream, it becomes the “custard” used for French ice cream. With additional yolks, gelatin, whipped cream and flavoring, it becomes Bavarian cream. A thinner version of crème anglaise. See more types of custard in our Custard Glossary. Curd is a type of creamy, fruit-based spread made of fruit juice, butter, eggs and sugar. Citrus and berry flavors are the most popular. Curd is more versatile than fruit butter, and can be used on angel cake, ice cream, pancakes, pound cake and other desserts, as well as on breads. Raspberry curd on lemon pound cake. Curd by Rowena. A chocolate sauce made of cream, butter, chocolate. In theory, fudge sauces are thicker than chocolate sauces, but there is no industry standard definition—it’s what the manufacture chooses to call it. Some fudge sauce recipes include cocoa powder as well as chocolate. Some chocolate sauces are thicker and more chocolatey than those labeled “fudge sauce.” “Hot fudge” sauce is simply the sauce heated up. When fudge sauce or chocolate sauce is heated, it becomes thinner. When at room temperature in the jar, they are as thick as fudge candy, and can be eaten with a spoon like candy—hence the name. A variation of a spread that can contain chunks of whole fruits: apple and pumpkin are popular flavors. It is commonly used instead of jam on breakfast breads and does not contain any butter—the term refers to the consistency.